Funny Monkey wearing fashionable shirt and cool dark glasses seems to be a real banana baron who always has sunny mood and is ready for unpredictable adventures. 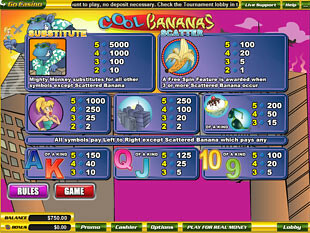 Cool Bananas slot machine powered by Vegas Technology is super funny game that promises a lot of prizes and a pile of positive emotions. Just follow the reels spinning and you will surely catch one of the highest winning combinations. 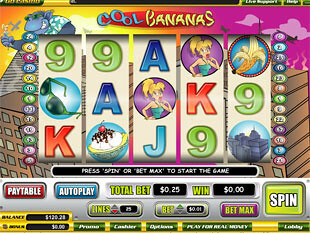 This 5 reel, 25 line video slot has wonderful graphics and cheerful sound of the reels spinning thanks to which you will completely enjoy cool bananas and 40 winning combinations. Cool Money is wild symbol that plays special role in this game, that is substitutes for other symbols excepting scatter. Plus, Cool Monkey acts as a double multiplier when it is a part of the winning combination. The scatter symbol is Banana that can appear in any position, in other words, can be scattered anywhere on the screen. This symbols pays in a particular way. The maximum scatter win is $25,000. Banana Monkey has its coin nominals starting from $0.01 and ending by $10.00. The minimum bet is $0.25, the maximum one is $250. If you play with maximum bet, you will have chance to win top jackpot of $50,000. Top jackpot is guaranteed if you catch 5 Monkeys on one active line. Free Spins will be activated if you catch 3 Bananas. Magic Bananas will award you with 40 Free Spins with 2x multiplier. So, you can win doubled top jackpot or $100,000 thanks to this wonderful bonus round. Cool Bananas game is amazing game with high quality graphics and funny symbols spinning to bring you incredible awards and unexpected surprises.